What now for the Geelong Cats, the AFL's most interesting team? As you might expect, the washup from Week 1 of this year’s AFL finals series has centred on the two eliminated losers. Well, that plus another dose of administrative idiocy from you know who. We knew it was going to come to this. The crazy Week 1 finals fixture has come back to bite HQ in a big way, leaving them with no choice but to bake in a bunch of advantages and disadvantages for the six remaining finals teams. In its desire to appease its paymaster – a common thread for most of the wrong decisions emanating out of AFL House in 2018 – by scheduling Richmond versus Hawthorn as the first game of the finals, and West Coast versus Collingwood as the last, the AFL has roasted the Pies or GWS Giants on an open fire. Collingwood, scheduled last despite being the only team required to travel in Week 1, faces the prospect of having to play Richmond off of a six-day break heading into a preliminary final (if they win against GWS next Saturday night). Should the Giants win, that break diminishes to five and 1/3 days on account of the Sydney Airport curfew (which kicks in at 11pm, meaning a flight would have to leave Melbourne at 10pm, which is likely to be some time in the last quarter). This has happened because the AFL could not have possibly done one of the two most obvious things to stop this from happening: schedule West Coast’s home preliminary final on the Friday night (because Richmond finished on top of the ladder so should get the benefit of an extra bit of rest heading into the Grand Final if they win their preliminary final. Spoiler: they’re winning it), or play both games on the Saturday (because Tim Worner is the real CEO of the AFL). We all saw this coming. Cam Rose wrote a scathing column about the fixture upon its release, and his concerns have come to pass. What’s even more stunning is the AFL not less than 24 hours apart stated that ensuring every team had at least a seven-day break was the priority in the finals fixture (nope) only to then completely backtrack on this position. All because – and I’m reading between the lines here but folks it’s in 96-point bolded font – the TV dollar is king. What’s done is done. It had to be said. Now, on to more important matters. Two teams joined the end of season crew this weekend, and they were two of the teams we’ve grown accustomed to being at least moderately successful: Sydney and Geelong. As is often the case, the heat is on, but particularly so for the Cats given we’re all sort of living through their radical list management experiment. Full disclosure: I picked Geelong as my 2018 premier in the preseason, and was still holding on to that view right until the last round when it emerged they would face the Dees in Week 1. No one was losing to Melbourne this weekend. So it was. Geelong’s loss was a microcosm of their season, and the team’s failings. They looked slow in transition – even though they tried to play a bit faster from the get-go, as they have shown is possible towards the back end of close games – applied minimal defensive pressure, and didn’t have enough avenues to goal. Melbourne have the worst defence of any team still left in it on practically every metric, yet the Cats were held to 34 points well into junk time. The club has signalled their intent ever since trading for Patrick Dangerfield in the 2015 offseason: we’re not rebuilding. Enter Lachie Henderson, Zach Tuohy, Zac Smith and Gary Ablett Jr. Even Sam Menegola, Tim Kelly and Tom Stewart in many respects, all of whom have joined the team as mature aged players since the Cats last finished outside the eight in 2015. Free agency being what it is, these acquisitions have cost the Cats what would have otherwise been a chance to draft younger players as is the usual way. More on that in a little bit. Some folks think it’s time the Cats look to inject a bit of draft capital into their list management balance sheet, because there isn’t a lot of young talent on a list with its most important players rapidly approaching or already beyond 30 years of age. That is the price of taking the – untested and frankly ballsy – route the Cats have taken. Notwithstanding, Geelong aren’t at Carlton 2014 levels of young talent. With the meagre draft capital it has cashed in recently, they appear to have drafted well: Lachlan Fogarty, Esava Ratugolea, Brandan Parfitt and Quinton Narkle were taken in the 2016 and 2017 drafts and played quality football this season (putting Kelly and Stewart to one side). Missing out on the top end of the 2015 draft, via trades for Dangerfield and Henderson, may have proven to be a little more costly than previously envisaged. That cohort has three seasons under its collective belt and right now looks ridiculously loaded: most of the top 20 project as above average to very special AFL-level players, and there is a handful of value picks towards the back end. Still, the Cats would move for Dangerfield 100 times out of 100. Geelong’s drafting in the years prior has been a little more problematic. The Cats’ last top-ten pick, Nakia Cockatoo, managed two games this season on account of injury. He’s made just 32 appearances in four seasons – surely a worry. His draft mate Cory Gregson has been similarly injury-hit. The duo, plus 2011 pick Lincoln McCarthy, play in the area of the ground Geelong need the most help: small/mid-sized forward. I was so high on the Cats in the preseason mostly on account of the club’s strong player availability position. Alas, Cockatoo, Gregson and McCarthy played 14 of a possible 69 games between them. 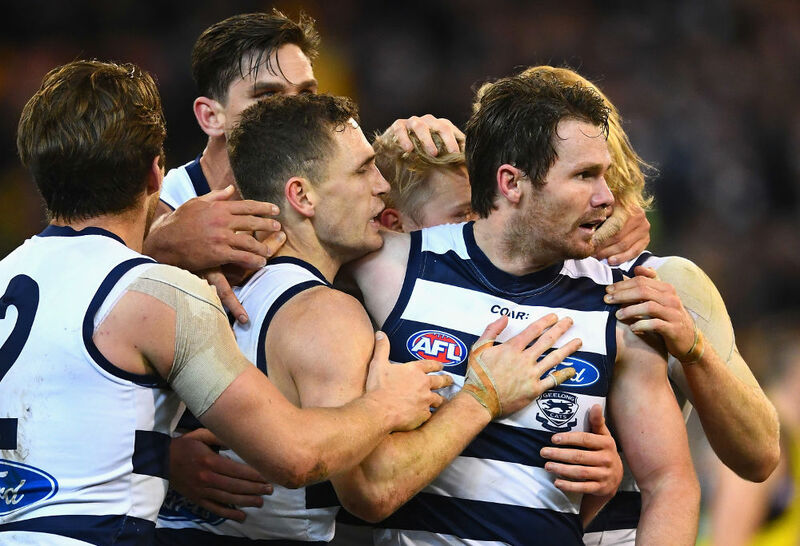 Despite the concerns about the age of Geelong’s list, they were surprisingly generally speaking the younger of the two teams in any given weekend. The Cats handed seven players an AFL debut in 2018, equal with Collingwood and St Kilda and behind only West Coast and Fremantle (eight each) for most in the year. 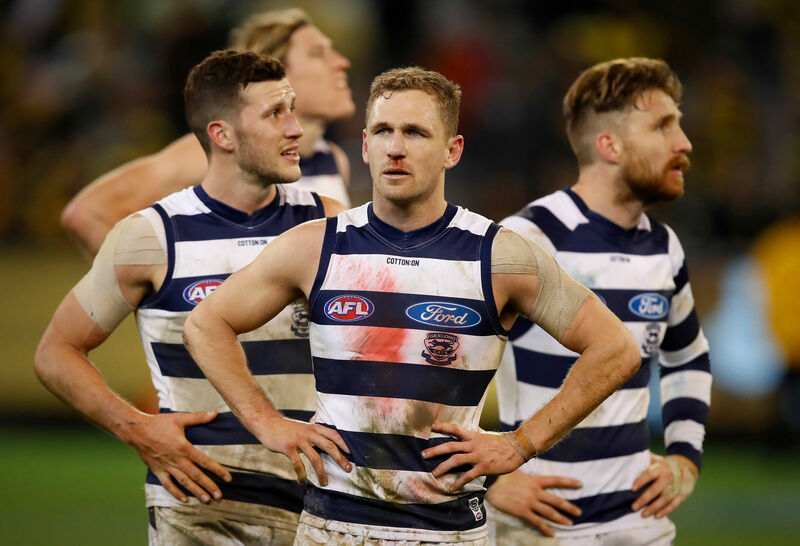 While it is true the top end of Geelong’s playing list is edging deeper into its prime – or has sailed beyond it – the Cats are no 2014 Hawks, 2016 Fremantle or 2004 Brisbane Lions. Indeed, Geelong are still a few years away from reaching the sort of demographic crisis it experienced as the last of its premiership heroes from that all-time great team began to age out in unison. In short, this chatter that the Cats are finished is mighty premature, and doubly so given we know how crafty the club has been in offseasons past. The Cats were one of the only clubs that exploited AFL House error relating to the future pick trading rules – which were not really set and understood across the industry until the middle of this year, three offseasons into the future pick trading economy – in bringing in so many mature-age players. However, with those rules now clarified (according to an AFL Media article at least), the Cats’ list management team finds itself in a bit of a pickle. According to the rules, they must use two first-round picks in 2018, or be in breach of future pick trading rules and be bound to use their first-round selection in 2019. The trick here is it’s not clear whether this means the Cats can still trade this year’s first-round pick or next year’s first-round pick, and simply accept the sanction that they be bound ‘next year’ for all eternity. 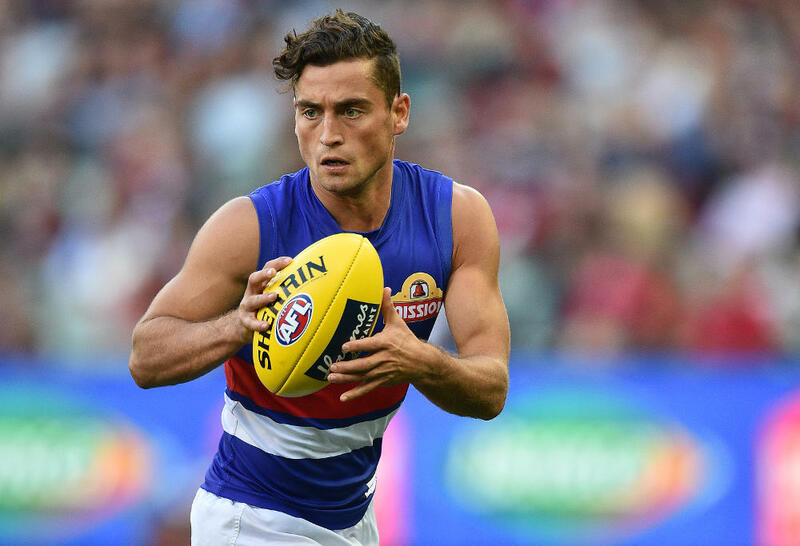 Regardless, there have been precious few players linked to the Cattery throughout 2018: Luke Dahlhaus is the only one, and he’s a free agent who the Dogs have essentially given their blessing to leave the club as a cherished premiership hero. This could change; it normally does. A strict reading of the AFL’s rules suggests the Cats need to move to acquire an extra first-round pick – or at least make an attempt to. There is no clear answer to this riddle; Geelong will not want to part with any of their players that may command a high pick, and they have no second-round pick to try and package up (they hold picks 11 and 47, and then a bunch of flotsam in the 50+ range). ‘Hitting the draft’ with their current hand is not going to move the needle, unless the Cats somehow happen upon some studs in the later rounds as they have in the past. Instead, the only path available to Geelong is the one they are on now: continue to contend with the list they have, and top up where it makes sense or is feasible. Consciously decelerating, as Alastair Clarkson now calls it, is not an option, because the most important players on Geelong’s list are in their prime years. Every game matters, every game wasted on trying to get younger for youth’s sake only makes the problem worse. The Cats have enough baseline talent to feel confident of making the eight for another year or two yet. Finishing in the middle six bracket, rather than in the top six as they have for the past two years, will give the club a better chance at a slightly kinder fixture. They will push again for an extra game at Kardinia Park, and that request should be granted. 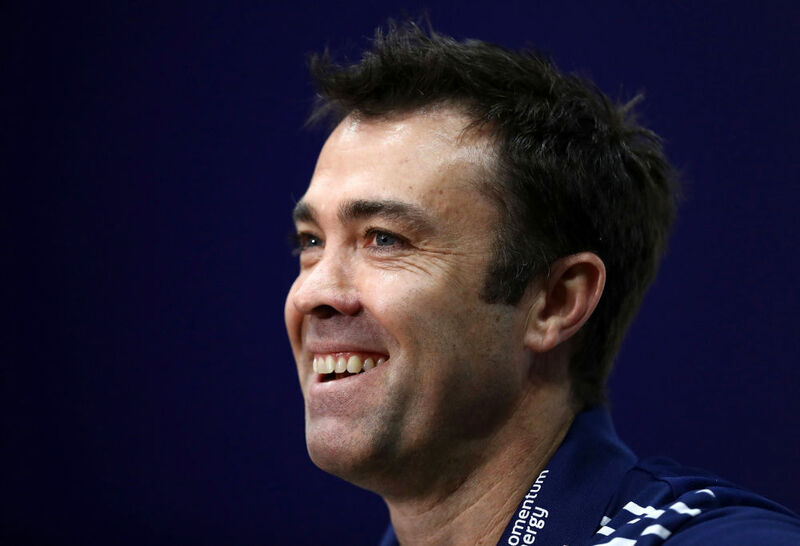 A first-round finals exist will surely spur the coaching group into action, particularly given Chris Scott was bested by a far less experienced coach in Simon Goodwin. Cats fans will be hoping so, because Scott is their man for the foreseeable future. His pre-finals extension looked a little out of place at the time, though it represents the faith the club’s leadership has in his record. Geelong had a natural pivot point to rest a decision on Scott’s tenure baked into his previous contract (which expired at the end of next season); we can only assume the club preferred the stability of locking in their man at a time when the relatively calm coaching waters of the league could turn cyclonic in an instant. Gary Ablett’s future will be debated – internally and externally – in the coming weeks. He’s had a fine season, particularly given he is now the fifth-oldest player in the league after Jarrad Waite’s retirement. Ablett was three goals and 19 disposals away from averaging 30 disposals and a goal a game, and despite all the knockers saying he was weak at the ball, he still averaged 11 contested possessions per game (more than Dyson Heppell, Bryce Gibbs, Shaun Higgins, Scott Pendlebury… you get the idea). Like all great sportspeople in this country, our short memories combined with our tallest of tall-poppy syndrome and inability to contextualise what we see before us has conspired to talk down what was a marvellous season. Ablett will surely be back. As will the Cats. The club have their challenges, but there is nothing that can be done about them now, other than to keep calm and carry on – with a tweak here or there, of course. Anything else would serve to make any problems – real or perceived – much worse.